Comics Experience Blog: COMMUNITY NEWS: New Trailer for Rich Douek's "Gutter Magic"
COMMUNITY NEWS: New Trailer for Rich Douek's "Gutter Magic"
We've previously told you about alum and Workshop member Rich Douek's comic book Gutter Magic. Well, Rich recently released a trailer promoting the planned five issue miniseries, written by Rich, with art by Brett Barkley, colors by CE alum Donna Gregory, and edits by CE staff member Paul Allor! 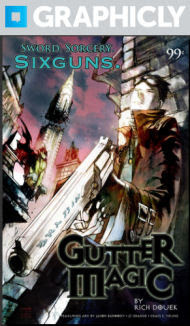 Gutter Magic tells a tale of sword, sorcery and sixguns in an alternate history where a magic-fueled World War II drove the world to the brink of apocalypse. Check out the trailer right below! Or check out Rich's site, SixGunComics.com for more info!